Joseph A. Cabaret, MD – Online Reputation Management | ASTRALCOM - Content Strategy, Conversion Marketing and Customer Acquisition. Joseph A. Cabaret, MD – Online Reputation Management | ASTRALCOM – Content Strategy, Conversion Marketing and Customer Acquisition. Joseph A. Cabaret, MD is a renowned physician on the cutting-edge of regenerative medicine, chronic pain management and opioid addiction treatment. Dr. Cabaret launched his own practice after being involved with several different medical groups, hospitals and other entities and he moved to a new office and location. But, now, none of the Google listings on page 1 had correct contact information. 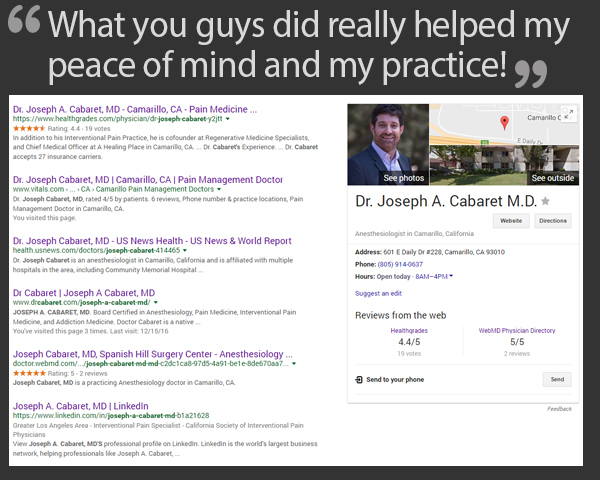 Dr. Cabaret was afraid that many of his current patients wouldn’t be able to find him and that newer patients would end up with the wrong contact and location information, become frustrated and give up. “We’ve got to get this situation corrected because it’s negatively affecting my business,” he said. So, together, we developed a critical action plan to effectively correct this issue for Dr. Cabaret, in short order. Read more about this in our post called In Search, Your SERP Listings Are Your Life. Contact us today and let us help you gain ownership of your name brand listings in Google.